Huge Savings Item! Free Shipping Included! Save 19% on the LUCID 2 Inch Traditional Foam Mattress Topper - 3 Year Warranty - Twin by LUCID at My Athenas. MPN: LU20TT20RT. Hurry! Limited time offer. Offer valid only while supplies last. Benefits of a Foam TopperThis 2-inch thick solid foam mattress topper made of traditional foam offers a responsive comfort layer at a smaller price. This 2-inch thick solid foam mattress topper made of traditional foam offers a responsive comfort layer at a smaller price. With naturally hypoallergenic foam, this topper will conform to your body weight and position to offer comfort and pressure relief. This foam helps to improve comfort by properly supporting your head, neck, and shoulders. The mattress toppers are cut one inch shorter on all sides to ensure your sheets fit over the topper. 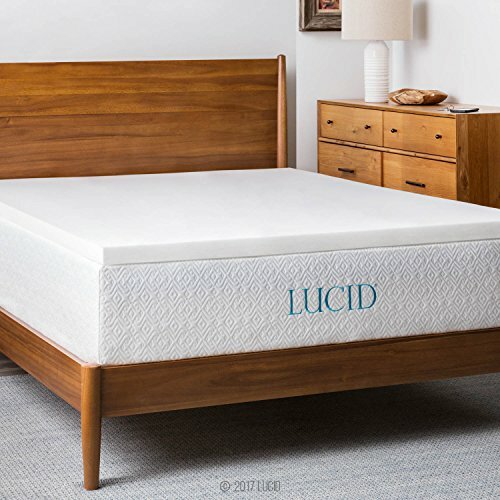 Enhance your mattress with this solid foam mattress topper by LUCID. This 2-inch thick topper is designed to be placed right on top of your current mattress for an added comfort layer. This topper will improve the current feel of your mattress and extend its life. Add a layer of comfort to your RV or camper mattress, or put a comfort layer between your sleeping bag and the ground. This affordable mattress topper brings comfort to the great outdoors. Rest easy with a 3-year warranty. This warranty protects the mattress topper against manufacturer's defects. If you have any questions about this product by LUCID, contact us by completing and submitting the form below. If you are looking for a specif part number, please include it with your message.